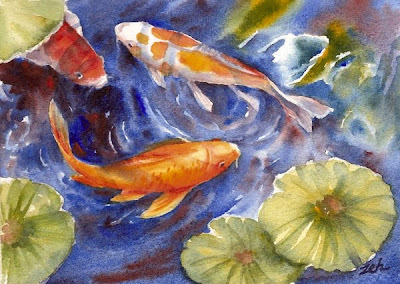 I saw these Koi in a garden pond when visiting a butterfly conservatory recently. The action of the fish moving and the swirling water is contrasted by the serenely floating lily pads in this painting. This painting has been sold. If you 'd like to see more of my artwork, visit my website, zehoriginalart.com. Thanks so much for visiting my blog!